Thick and crunchy baked steak fries- ultimate comfort food healthier way without sacrificing the flavor and texture! French fries are my all-time favorite. Curled fries call my name quite often. Steak fries are my ultimate weakness. Thick and crunchy, they are so addicting! Not long ago I got rid of my deep fryer, because I don’t use it that often anymore. And it was time for me to finally try baking the fries, instead of deep frying them. To be honest, I never had success with baked sweet potato fries. No matter how many tips and tricks I have implemented, they always turned out a little soggy to my taste. However, these steak fries are a different story. Totally crispy, thick and satisfying! 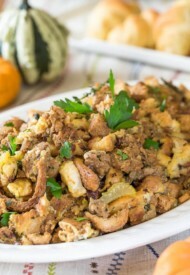 Did I mention it is super easy to make? 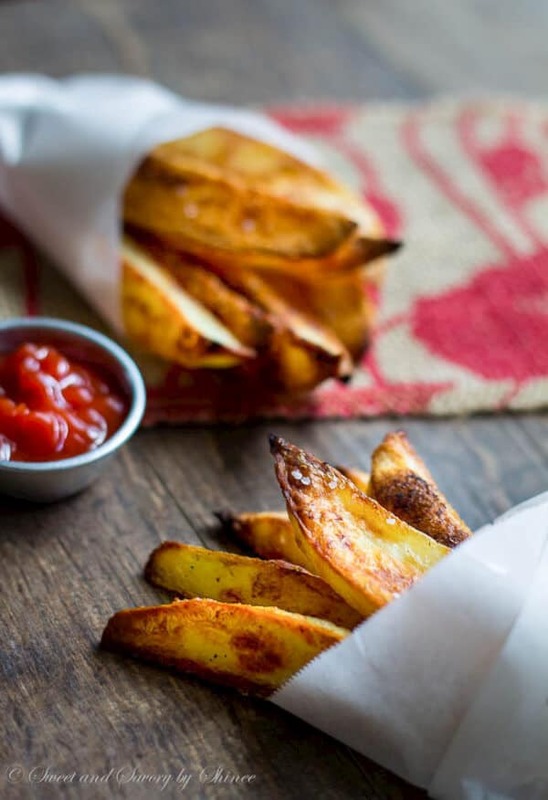 Take a break from the grill and bake these delicious fries some time this summer. The secret to perfectly crisp and crunchy fries is soaking the potatoes in cold water and drying them thoroughly before coating with oil. I’m adding just a little bit of butter for flavor, but do not add more than specified in the recipe, because butter has about 15-20% water, which will become steam in the oven. Which one is your favorite: french fries, curled fries, or steak fries? Wash the potatoes, and peel them, if desired. 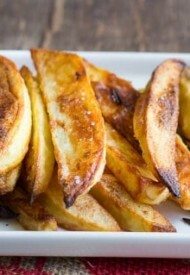 Cut into thick wedges and soak in cold water for about 20-30 minutes to get rid of as mush starch as possible. Preheat the oven to 425 degrees F (220 degrees C). 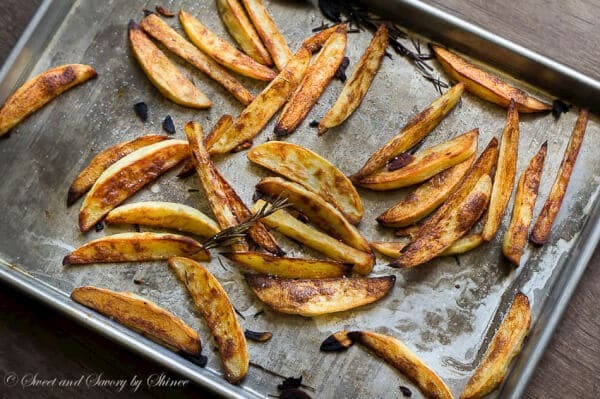 Put the baking sheet in the hot oven for 2-3 minutes, while you work on potatoes. 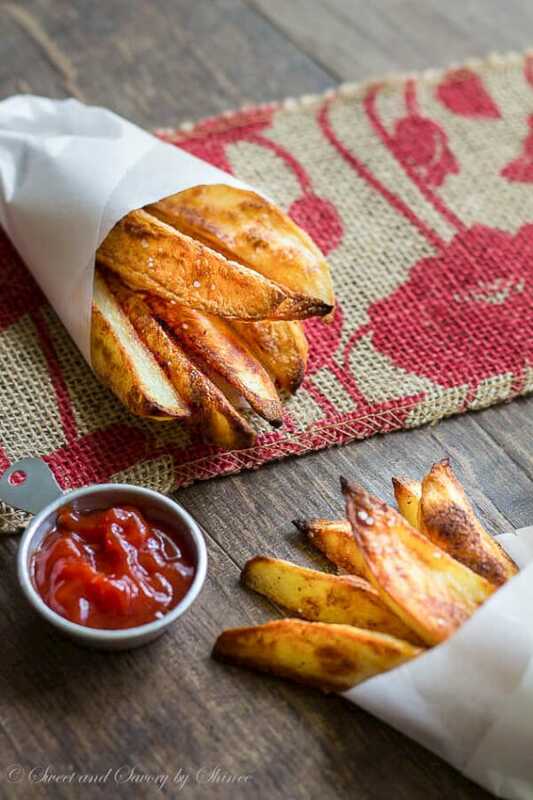 Drain the water and thoroughly dry the potato wedges with paper towel. 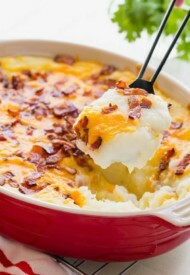 In a large bowl, toss the potatoes with canola oil, melted butter and garlic powder. 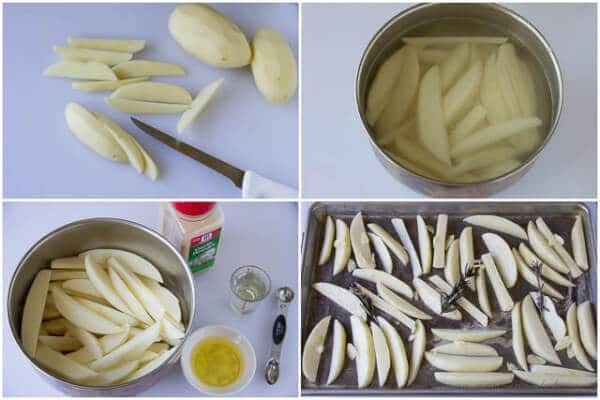 Lay the potato wedges on the hot baking sheet in single layer. 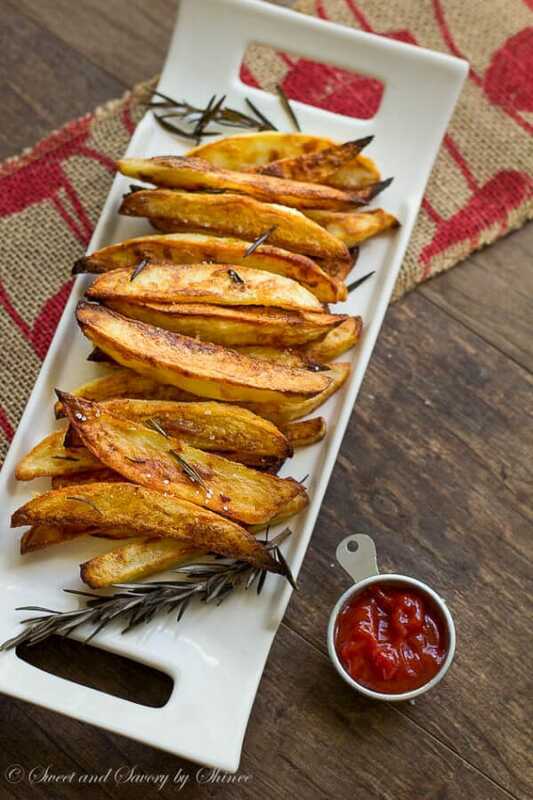 Throw the garlic slices and rosemary over the potato wedges. Bake for 35-40 minutes, or until nice and golden brown. You can also broil for the last 3 minutes for a little extra brown color. While the fries are fresh out of oven, sprinkle some kosher salt and ground black pepper to taste and toss to coat evenly. You should include ALL instructions in the written directions. Nowhere does it tell you where to use the sliced garlic and rosemary when you print them. Emory, so sorry about that. I just updated the recipe. Thank you for letting me know.